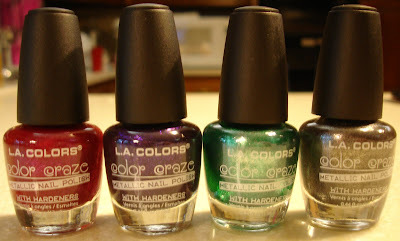 I was at the CVS yesterday waiting for a prescription, and I noticed a really fun little four-pack of nail polish from a brand I had not heard of much before, L.A. Colors. They looked really pretty - and were a great deal - so I snagged one. 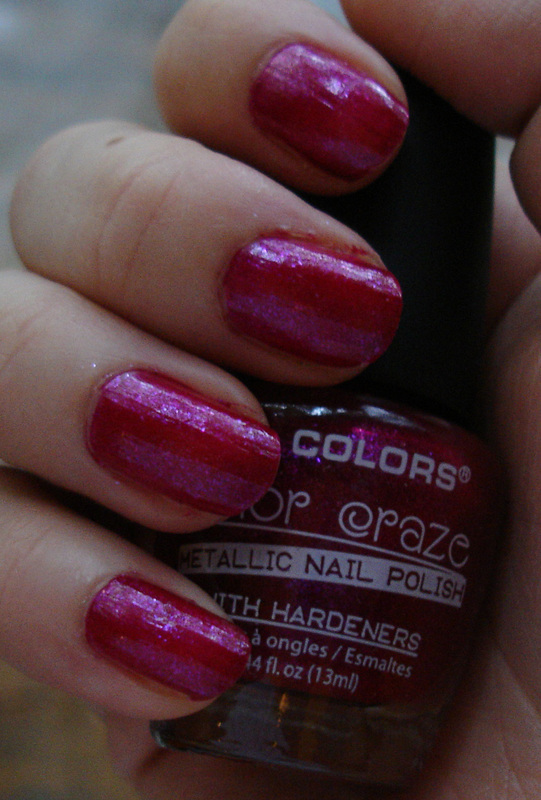 This is a very nice medium pink, with a lot of microglitter. I would almost call it a fuchsia. It is not nearly as bright as it appears in the artificial light photograph; the natural light photo (left) was much more indicative of its true color. This was two coats; application was mostly good, possible a little bit gloopy but I think that was really mostly my fault, not the polish. Dry time was great, and the final result was very pretty! This is a dark, rich purple with blue tones and again, tones of microglitter. For this color, the artificial lighting (right) was much better at capturing the true look - it is not nearly as blue as it seems to be in the natural light picture, as I think more direct light really brings this one out. 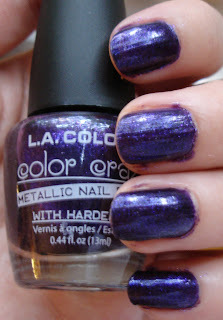 This color kind of reminds me of a non-duochrome version of Orly Out Of This World. 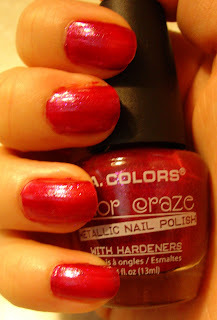 This was a three-coater for me; 2 coats was almost enough, but not quite. Application was smooth and the dry time was pretty speedy. 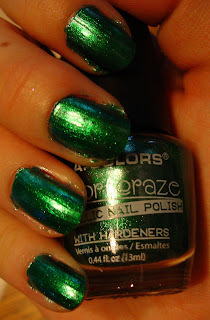 This polish is a really pretty blue-toned green, and again very glittery. Smooth, two coat application and fast dry time. Natural light (left) is a bit closer to real color, as it is not quite as saturated as it appears in the artificial light. This one stained pretty badly though - only had it on for a couple of minutes and her fingers had a slight green tint when we took it off. 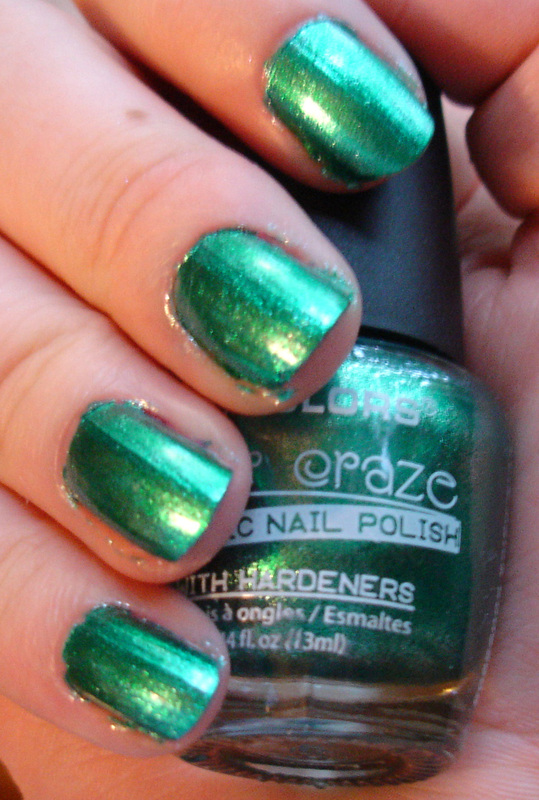 This is definitely one you will want to use a base coat for! 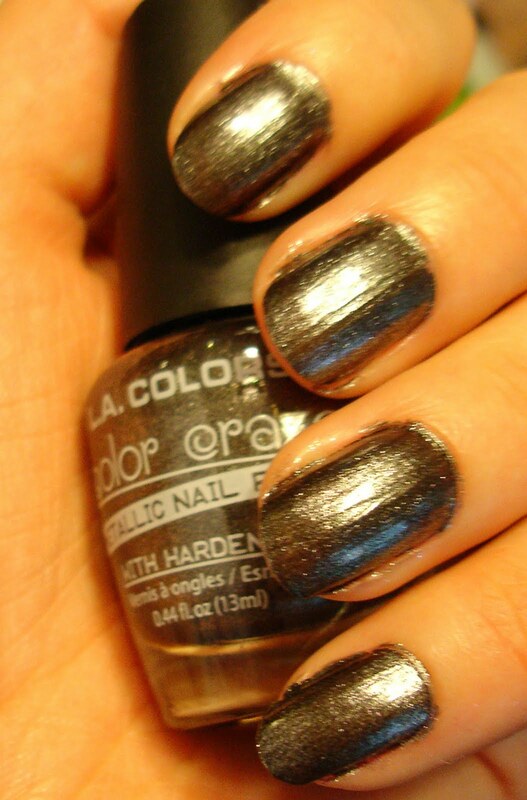 This gray really does look like metal on your nails! 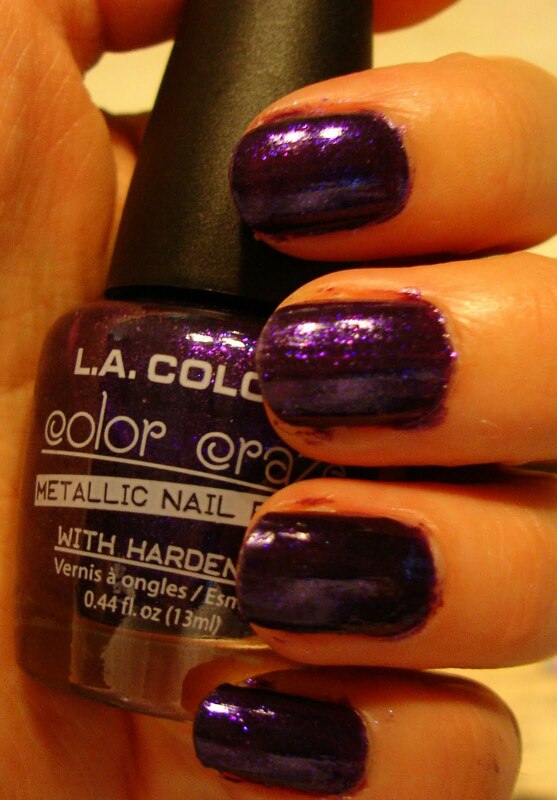 It is a gorgeous medium gray color, loaded down with glitter. The natural lighting (left) is probably your best bet on color for this one. This was another two coat polish, like most in this collection, with speedy dry time and smooth application. This may be one of my favorite grays ever. I really liked this collection - I thought all four of the colors were excellent. I have never used this brand before and was fairly impressed with how it looked/applied/wore over time. It really goes to show you that sometimes the cheaper drugstore brands can be just as great (if not better) than some of the high end brands! I will have to pick up some more of this brand in the future. 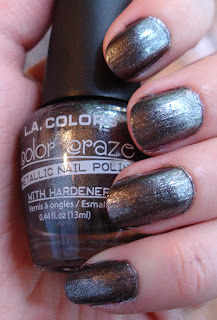 In the end, Becky decided to keep the gray on her nails, and added a coat of Sally Hansen Hidden Treasure for a subtle difference in color. This did not show HT quite as well as the blue I showed you previously, but it is more noticeable in person and gave the mani a pretty cool effect. 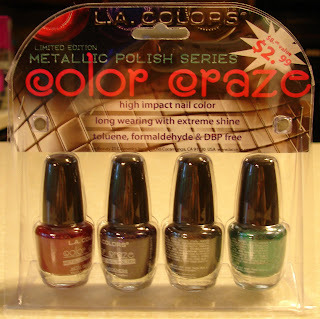 Have you all used this brand before, or another cheaper drugstore brand you love? 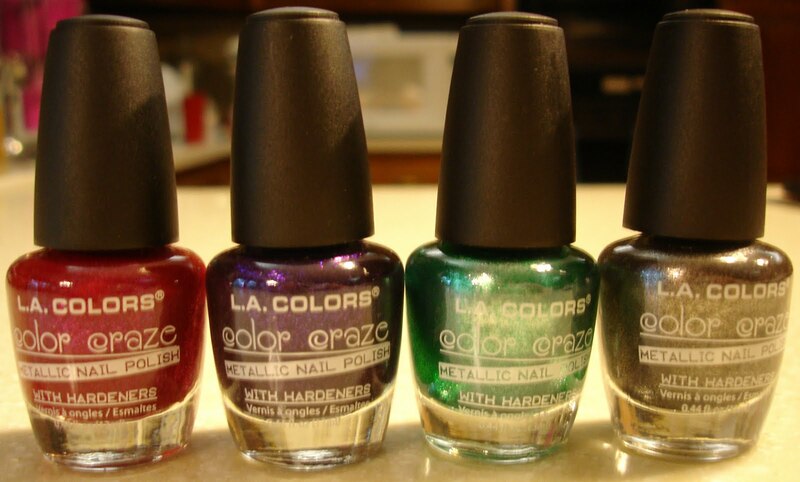 What do you think of the metallics collection?